Multiple monitor setups are pretty popular these days for their comfort of use. If you are a programmer, a designer or even a gamer, you will definitely love a dual or triple monitor setup. You can use 2 or 3 screens at a time to read long lines of code, browse extra tabs and plenty of other stuff. It may seem hard to choose a monitor for dual or triple monitor setups since there are lots of brands, models, monitor sizes, and resolutions to choose from. Luckily, you have ended up visiting our guide. In this guide, you will find a list of best monitors for dual and multi monitor setups. We have made a deep research in Reddit, Amazon, forums, communities and Facebook groups to learn which monitors are usually picked for multi monitor setups. Below, you may find the most popular monitors among multi monitor setup users. After that, you may find several monitor recommendations for multi monitor setups. Then, you may find detailed explanations about choosing a monitor for multi setups, including topics like display panel, screen size, resolution, refresh rate, rotation and inputs or outputs. Lets get to work! Also see our guide for choosing the best computer desk for multiple monitor setups. 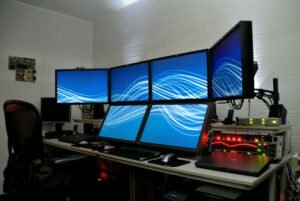 If you want to build a multi-monitor setup, your budget is the most important factor since there are endless combinations. So we will try to recommend a proper multiple monitor setup for each budget. We have made a deep research in Reddit, Amazon, forums and so many other websites to determine popular multiple monitor setups among users. Below, you may find a few recommended multiple monitor setups and you are free to choose the best one that fits your needs and your budget. After these, you may find a detailed guide about choosing a monitor for multi monitor setups. We have made a deep research and seen that the most popular setups are built with 2 or 3 1080p monitors. Full HD monitors are really affordable these days and they still provide enough space for most of business purposes. Many multi-monitor setup owners use double or triple full HD monitors to create a professional workspace. Choose a 22″, 23″ or 24″ sized 1080p monitor and combine two or three of them. Don’t forget to consider thin frames and IPS panel for your monitors. A setup with two or three 144op monitors is another popular setup among multi-monitor users. Naturally, 1440p monitors are a bit more expensive than 1080p monitors but they provide better image quality and are better for your eyes. 2 x 1440p monitors would be enough to create a professional multi-screen working environment. Pick a monitor which is 24″ or 27″ and don’t forget to prefer monitors with IPS panel and thin frames. I would definitely recommend to consider products with portrait mode and if you have the budget, go for 27″ ones. If you don’t need to stick to a budget, 2 or 3 4K monitors would be the best choice for multi-monitoring. This will be the ultimate setup and you may use your new working environment for at least 4-5 years. 4k monitors will provide an enormous working space which is 4 times larger than a 1080p monitor. You will also love to watch movies on your 4k multi-monitor setup. 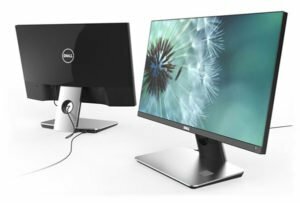 How to Choose the Best Monitor for Multiple Monitor Setup? If you want to choose a monitor for multiple monitor setups, you need to know a few things first. Most importantly, your new monitors should be nice to your eyes since you will spending hours looking at them. There are also other things you need to consider like display panel, resolution, screen size, inputs and outputs, rotation ability and more. Here learn about these topics, one by one. Screen size is one of the most important things when you want to choose a monitor for multi monitor setup. Bigger workspace always helps you to work effectively. There is also a study proving that larger screens boost productivity for many people. You should also keep in mind that bigger screens should have a high resolution display for best performance. So the best thing you can do is picking your monitors by their resolutions. For 1920 x 1080p, your larger screen size should be 24″. 1440p resolution will be enough for any monitor up to 27″. For any screen larger than 27″, I would definitely recommend to choose 4k monitors which are very popular among programmers. Along with screen size, screen resolution is another important factor when choosing a monitor for multi-monitor setup. A monitor with high resolution will provide you a better view of texts, images and basically everything. In these days, I won’t recommend any monitor has lower than 1920×1080 resolution. 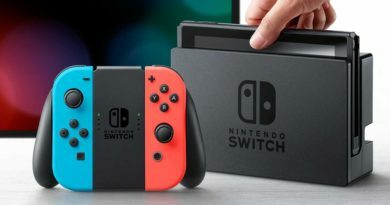 This resolution will be enough for monitors smaller than 24″ but for bigger screens, you should aim at least 1440p or 4k resolution. If you are on a tight budget, 1080p would be fine for double or triple monitor setups. There are 3 main display panels for a monitor. They are Twisted Nematic (TN), In-Plane Switching (IPS) and Vertical Alignment (VA) panels. For multi-monitor gaming setups, TN or VA panels would be fine. But if your aim is to use your setup for business purpose, you should definitely prefer monitors with IPS panel because these panels provide the best color quality, viewing angles, contrast and they will go easy on your eyes. When building a multi-monitor setup, it is good to know your monitor’s inputs and outputs. You should check your laptop’s, Mac’s, or PC’s outputs before you buy a monitor. 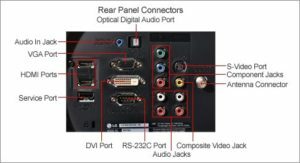 Most of the modern computers have at least a HDMI or mini HDMI port on them and some have DVI, VGA or Display Port. If you will build a Mac based system, you may also consider Thunderbolt supported monitors. Another thing you need to consider is your new monitor’s rotation ability. My recommendation would be to buy a monitor which can be used in portrait mode too. Don’t estimate the power of rotation because this will sometimes provide great results regarding to your working style.